Sunday afternoon Abby and I were napping. I was nodding off and on as I read my iPad, and she had fallen asleep reading her Kindle. She continued her nap for a bit, and when she woke up, she remembered dreaming about moving to Sioux City and buying an airplane. It was an intimate, quiet moment. It felt good. 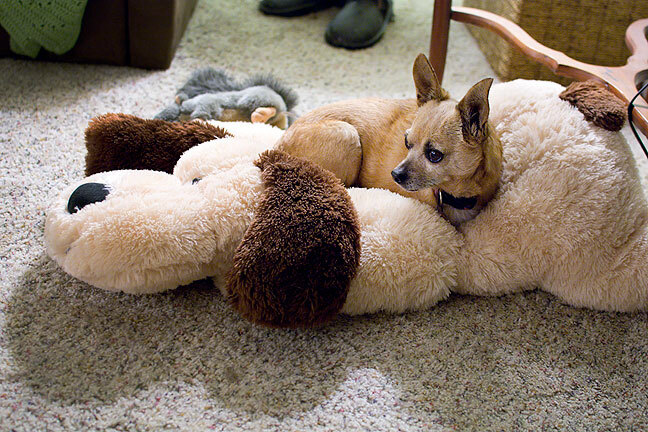 Hot dog-on-dog action: Max the Chihuahua lays on Skipper the stuffed dog last night. I won’t ruin a gentle moment by telling you about my disturbing nightmare. Have a lovely September. You do realize that it’s really an unconscious intersecting of parallel realities where the sympathetic resonance of one intertwines with the dream-state of the other. That Richard and Abby keep wondering why they dream of living a simpler life instead of their independently wealthy, jet-pack fueled, globetrotting adventure that they currently share.